I am launching a periodic newsletter! To celebrate and to thank readers for subscribing, I am offering a free ebook of vignettes. Click to subscribe and join the fun! The paperback has hit the ground, and the Kindle is locked down for Amazon's release date. It's finally here! For those who have not yet sampled the delicious perfection that is John Thornton, he has been called "The Victorian Darcy" or "Darcy of the North." While his character is most decidedly unique, formed by very difference circumstances, Pride and Prejudice fans will recognize many similar threads running through Elizabeth Gaskell's classic story North and South. Not only do we have a stoic, proud hero, but we also have a strong-willed heroine whose determination and intelligence we cannot help but admire. 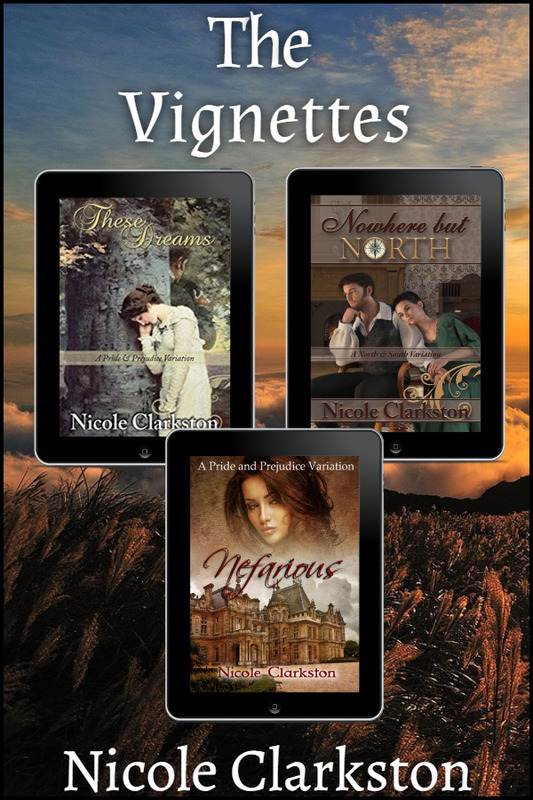 The Victorian era Margaret Hale is no Elizabeth Bennet of Regency times, but they share the same sort of passion in very different personalities. I have loved spending time with these remarkable characters, and I hope you enjoy them, as well. The wait is almost over for another North and South variation! Check out the cover reveal and giveaway for Nowhere But North, over at Janet Taylor's blog More Agreeably Engaged. Leave a comment to be entered in the launch day giveaway! Stop by More Agreeably Engaged today for a cover reveal of London Holiday! Janet also has an excerpt from the book, and she is having a giveaway. Hope to see you there! New Vignette from These Dreams! Check out Diary of an Eccentric for a new vignette about Richard and Amália and a chance to win the giveaway! These Dreams Blog Tour with Giveaways! Hey, everyone! The cover for These Dreams is live, and you can check out the story behind it at More Agreeably Engaged. The back cover is even more stunning than the front, if you ask me, so be sure to check it out. Also, drop a comment for a chance to win an eARC. You can have a copy before it hits the shelves! I have posted the entire first chapter for one of my current WIPs, Nowhere But North. If you, like me, have been missing John and Margaret lately, stop on by! Meanwhile, I will be visiting with Darcy and Elizabeth, trying to finish their story. I will be sharing bits of that soon as well! The Courtship of Edward Gardiner: A Pride & Prejudice PrequelThe blog tour is underway! Today is the fifth stop on the tour, at Candy Morton's blog "So Little Time." Come see what George Wickham has to say in his journals about 14 year old Fitzwilliam Darcy! Each stop on the tour has its own giveaway, so enter for another chance to win a copy!